Custom manufactured clad composite wire that can combine several materials to achieve specific properties or join incompatible materials for connect-ability is available from Anomet Products of Shrewsbury, Massachusetts. Anomet Medical Clad Composite Wire combines two or three metals on the interior and exterior which are metallurgically bonded to achieve properties that are not available in a single alloy. Featured properties can include radiopacity to achieve high visibility under fluoroscopy and eliminate the need for marker bands, biocompatibility, kink-resistance and shape memory, conductivity, and solderability of incompatible materials. 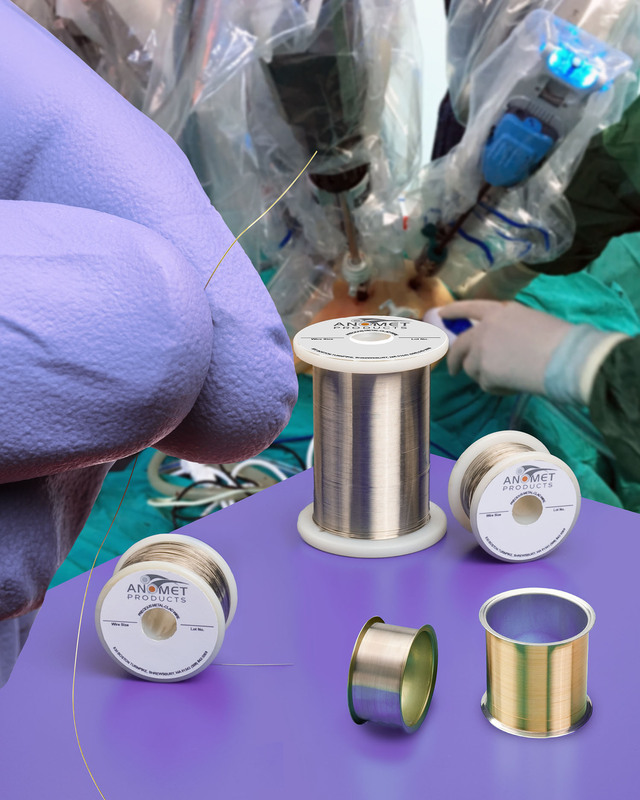 Ideal for implantable medical devices and catheters, Anomet Medical Clad Composite Wire is available in sizes from .002” to .125” (.05 mm to 3 mm) O.D. with 2% typical cladding thickness. Applications include precious metals on the exterior such as platinum, tantalum, or gold clad to interior materials such as copper, stainless steel, MP35N®, Nitinol®, nickel-iron, niobium, palladium, tantalum, titanium, and other alloys. Anomet Medical Clad Composite Wire is priced according to configuration and quantity. Samples and price quotations are available upon request.